Prolonged exposure to too-dry or too-damp climates can cause loss of resonance and shorten the life of your valuable guitars. 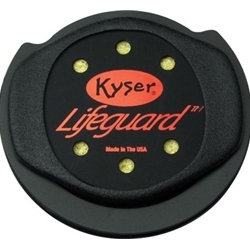 The Kyser Lifegaurd KLHA 6/12-string Humidifier is easily installed and removed from the sound hole. The Lifeguard Humidifier regulates the humidity inside the instrument. The Lifeguard absorbs excess moisture in damp conditions, and humidifies in dry conditions. It's a smart, inexpensive way to protect the investment you've made in your guitars.